← Goolsbee on Supply-Side and Subprime. Check out that CBS Moneywatch link for the full argument. The first chart is the leverage ratio – debt/assets, by income distribution. From 1998-2007 we see the leverage ratios of the top 10% decline, while the leverage ratios of the 20%-90% range of household income range skyrockets. Notice that the average overall doesn’t change much, but the dynamics underneath involves a lot of shifting around, with the biggest percent gains in the 20-60% of the distribution. 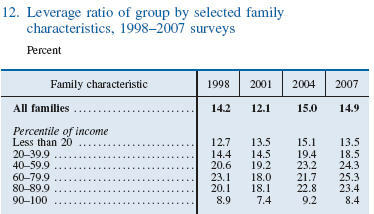 The second chart (click through to see the whole thing) is the ratio of debt payments to family income. We are interested in the first two boxes, which are the aggregate and median for debtors. Once again, same dynamic. 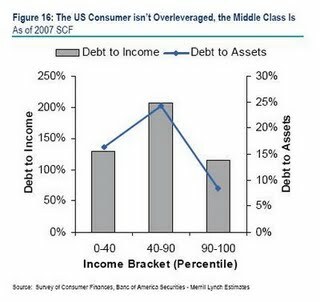 From 1998-2007 we see the debt payment ratio of the top 10% decline, while the leverage ratios of the 20%-90% of household income range increases. This also happens with the median value of the top 10% of income; so those at the 95th percentile of income also see a similar decline. What’s more, on the asset side, BofA Merrill says the middle-class has suffered more than the wealthy from the housing crash because middle-class families tended to rely more on their homes to build savings through rising equity. Also, the wealthy naturally had a much larger and more diverse portfolio of assets — stocks, bonds, etc. — which have mostly bounced back significantly this year. I think the most sensible way to get through this debt is to have well designed mechanisms for writing down housing debt, where homeowners take a penalty and creditors get an excessively large claim on future housing price appreciation. Lien-stripping (“cramdown”) would have been the smartest way to do this and I hope that it will still be a possibility at some point in the future. Getting aggressive about the valuation of second-lien mortgages on the books of the largest banks would also be a good idea. But regardless, extending the tax cuts for the richest 3% of American’s won’t help with the balance sheet overhang problem. Good for them but bad for policy options, they simply are doing too well to be hit by these concerns. 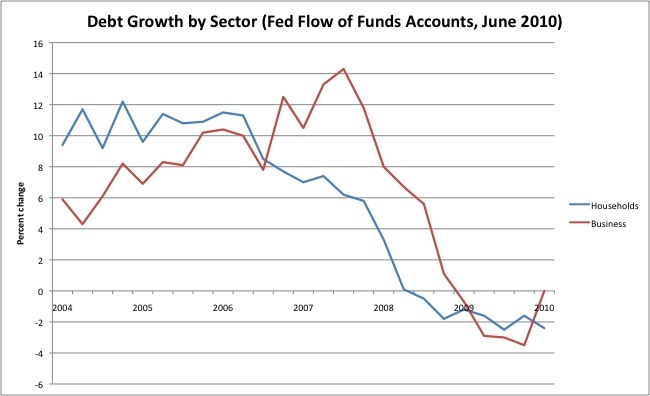 Graphs like these really make me wonder the degree to which the financial crisis is really a problem at all. Reinhart and Rogoff claim it’s all about the financial crisis — but that doesn’t entirely make sense. Loans to business have remained relatively robust, as commercial banks have been relatively stable. Bank runs in the shadow banking system shut down securitization, but that mostly hurt consumer credit, which would have shown a drop in demand anyway, and has been boosted with government assistance. Meanwhile, we’ve had past instances, 73-74, 82-83, 88-91, when we had serious banking problems, without losses for households. The recovery then was just fine. So how many of problems would we have if we kept around Lehman Brothers, but still had massive housing losses and an oil spike? Potentially, we would have had most of them. So why don’t we do more to solve this problem? A little bit of inflation here (3-4%) would really wind these debts down over time. A Fed-financed helicopter drop of cash to households would get inflation to that point, cost the government nothing, and allow households to deal with this issue. Am quite partial to the view that we ought to be restructuring household debt in a manner analogous to the Home Owner Loan Corporation of the 1930s (rather than placing excessive focus upon a fat spread, NIM recapitalization of the financial system), since there’s a lot of solid research by Leamer, Gjerstad & Smith, Mian & Sufi highlighting the impact of residential construction upon business cycles. If you’re not already aware of it, former Citigroup analyst Ajay Shah of ‘plutonomy’ fame has published a recent report, which revisits some of his earlier arguments regarding shifting wealth and consumption dynamics. Sanguine spin aside, it is an instructive read as far as grasping the rationalizations of more politically expedient proposals – which equate restoration of ‘animal spirits’ with tax breaks for the rich, and the dislocations of middle class deleveraging as economically irrelevant. I don’t know why we aren’t simply talking about reducing the income tax on the first, say, $50,000 worth of income. Aside from a payroll tax holiday, it would be the quickest way to help the balance sheet of ordinary households. That said, cramdown still remains the best option, aside from the fact that it would expose the zombie banks for what they are. This is the core of the matter, and why this is going to go on for a long time. It’s a dilemma: if the government is aggressive in marking down the principal of all that overpriced bubble mortgage debt, the “banks” will be shown to have a lower level of assets than they claim. So the “soon to be foreclosed” must play the HAMP game in order to prop up essentially insolvent banks. Treasury has essentially admitted that this is their strategy: slow roll all the foreclosures so as to avoid another financial collapse, in the hopes that by the time all the overpriced housing stock gets marked down, the economy will be better. Extend and pretend until they find the pony. In retrospect, the failure to implement a cramdown program was the biggest tell that nobody was going to be serious about addressing the fundamental problems.